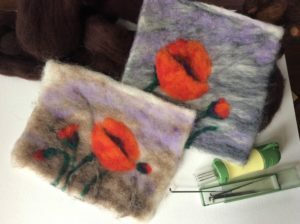 Local artist Lynn Haygarth will be instructing a workshop on Needle Felted Painting! Start with a prefelted ‘canvas’ and lay pieces of wool roving on top of it. With a barbed needle we will start the dry needle felting process. Adding more layers of coloured roving we will paint a mini landscape that will be suitable for framing. 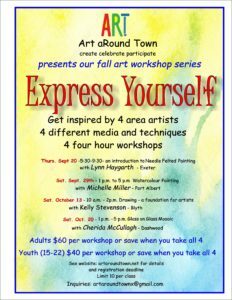 This workshop will take place Thursday, September 20, in Exeter, from 5:30 – 9:30 p.m.
Art aRound Town is offering a Fall Workshop series to help you find a new way to Express Yourself! 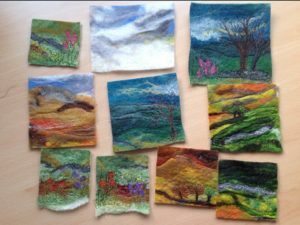 This year we have workshops in Needle Felting, Watercolour, Drawing and Glass Mosaic! This is a unique opportunity to try new techniques and something more than your average paint night! More details on each workshop to follow, so stay posted to the website and our Facebook page!! Mark it on your Calendars!! Tickets available at Gregarious Cravings or Mirror Image in Exeter! 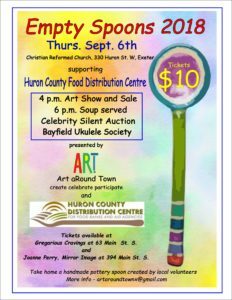 Last year sold out – don’t miss out on this fun event!